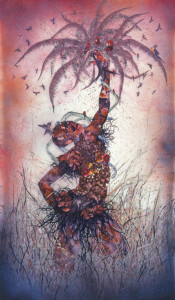 Wangechi Mutu: A Fantastic Journey is the first survey in the United States of this internationally renowned, Brooklyn-based artist. Spanning from the mid-1990s to the present, the exhibition unites more than fifty pieces, including Mutu’s signature large-scale collages as well as video works, never-before-seen sketchbook drawings, a site-specific wall drawing, and sculptural installations. It’s the place where Susanne Vega wrote “Tom’s Restaurant,” but Tom’s Restaurant is just as famous for its food. With a near insane breakfast menu, expect items like pancakes with apples and pecans to be brought to you by the sweetest waitresses in Brooklyn. Soda Bar is a great place for drinks. The alcohol is cheap, there’s surprisingly excellent food, and there’s even another room where DJs spin. If it’s too much, you can hang outside in the backyard patio under the stars. The Old Brooklyn Parlor specializes in old school drinks like the Brooklyn Egg Cream and the Lime Cherry Rickey, making it an excellent anchor to this neighborhood.